Next on our tour of the Layer II toolbar is the CopytoLayer command. Click the command and then select a layer that you want to copy onto another layer. This does not move the entity, it makes a copy of it on the target layer. 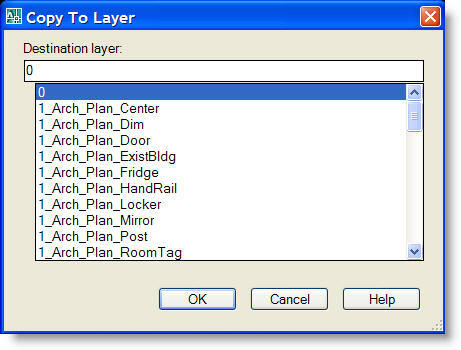 Once you have selected the entities, hit enter and the select the target layer. If you type in “N” for name, it displays a list of layers that you can select as the destination layer. (note: these are not my layer names – it is a demo file from Autodesk). You can also enter a name in the Destination Layer box to create a new layer. The new layer inherits the properties (on/off, freeze/thaw, locked/unlocked, etc.) of the current layer.